I read this article and found it very interesting, thought it might be something for you. The article is called Nobel Laureate Economists Say Free Market Competition Rewards Deception and Manipulation and is located at http://evonomics.com/nobel-prize-economists-say-free-market-competition-rewards/. It’s “the economy, stupid!” said James Carville, campaign advisor to presidential candidate Bill Clinton in 1992. He wanted to stick it to President George H. W. Bush for an array of economic problems that were tied to the economic recession that started during the Bush presidency. Well, we have a different, broader interpretation of Carville’s statement: that many of our problems come from the nature of the economic system itself. 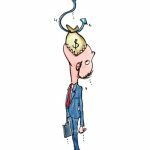 If business people behave in the purely selfish and self-serving way that economic theory assumes, our free-market system tends to spawn manipulation and deception. The problem is not that there are a lot of evil people. Most people play by the rules and are just trying to make a good living. But, inevitably, the competitive pressures for businessmen to practice deception and manipulation in free markets lead us to buy, and to pay too much for, products that we do not need; to work at jobs that give us little sense of purpose; and to wonder why our lives have gone amiss. We wrote this essay as admirers of the free-market system, but hoping to help people better find their way in it. The economic system is filled with trickery, and everyone needs to know that. We all have to navigate this system in order to maintain our dignity and integrity, and we all have to find inspiration to go on despite craziness all around us. We wrote this essay for consumers, who need to be vigilant against a multitude of tricks played on them. We wrote it for businesspeople, who feel depressed at the cynicism of some of their colleagues and trapped into following suit out of economic necessity. We wrote it for government officials, who undertake the usually thankless task of regulating business. We wrote it for the volunteers, the philanthropists, the opinion leaders, who work on the side of integrity. And we wrote it for young people, looking ahead to a lifetime of work and wondering how they can find personal meaning in it. All these people will benefit from a study of phishing equilibrium — of economic forces that build manipulation and deception into the system unless we take courageous steps to fight it. We also need stories of heroes, people who out of personal integrity (rather than for economic gain) have managed to keep deception in our economy down to livable levels. We will tell plenty of stories of these heroes. The late nineteenth century was a busy time for inventors: the automobile, the telephone, the bicycle, the electric light. But another invention of the time has received much less attention: the “slot machine.” Slot machine in the beginning did not have its present-day connotation. The term referred to any sort of “vending machine”: you deposited your coin in a slot; you got to open a box. By the 1890s slot machines were selling chewing gum, cigars and cigarettes, opera glasses, chocolate rolls in individual paper wrappers, even quick looks at the precursor-to-the-phone-book city directories— all manner of things. The basic innovation was a lock activated by the deposit of a coin. But then a new use was discovered. It wasn’t long before slot machines began to include gambling machines. A newspaper of the time dates the appearance of slot machines in this modern sense to 1893. One of those early machines rewarded winners with fruit candy rather than money; it was not long before everybody ascribed special meaning to that rare coincidence: the appearance of three cherries. Then the regulators stepped in. Slot machines were ruining so many people’s lives they had to be outlawed, or at least regulated, along with gambling more generally. They disappeared from public life, relegated almost entirely to the fringe: to special places designated as casinos, and to loosely regulated Nevada, where slot machines are widely to be found in supermarkets, gas stations, and airports; the average adult spends 4 percent of income on gambling, nine times the US national average. But even in Nevada there are some limits: in 2010 the Nevada Gaming Control Board rejected a proposal to allow convenience store customers to take credit on a slot machine, rather than their usual change. With computerization, the slot machine has entered a new career. Following the title of the 2012 book by MIT’s Natasha Schüll, the new machines are addictive by design. Mollie, whom Schüll met at Gamblers Anonymous in Las Vegas, demonstrates the human side of this addiction. Mollie drew for Schüll a map that represents how she sees herself. It shows her as a lonely stick figure, standing by a slot machine, surrounded— entrapped— by a circular road. That road connects six of the most important places in her life: the MGM Grand, where she works as a reservationist; three spots where she gambles; the site of Gamblers Anonymous, where she tries to cure her gambling; and, finally, the site where she picks up medicine to fight her anxiety disorder. Mollie is fully aware of her problem: she does not go to the slots with an expectation of winning. She knows she will lose. Rather, she is drawn by a compulsion. And when she gets there on her binges, she is solitary; the action is rapid and continuous. Mollie goes into what she calls “the zone.” Press the red button. The lights and the show come on. She wins or loses. Press the red button one more time. And one more time. And one more time. Again. And again. And again … until the money is all gone. Mollie is not some outlier in Vegas. Ten years ago deaths due to cardiac arrest were an especially serious problem in the casinos. The emergency crews could not get through. Finally, the casinos created their own specially trained defibrillation teams. One surveillance video shows why such special training was necessary. In the video, as a squad from the casino defibrillates the heart arrest of a fellow player, the surrounding players play on, their trance unperturbed, even though the victim is literally at their feet. The history of the slot-machine-good/ slot-machine-bad from the 1890s to the present illustrates our dual view of our market economy. Most fundamentally, we applaud markets. Free markets are products of peace and freedom, flourishing in stable times when people do not live in fear. But the same profit motive that produced those boxes that opened and gave us something we wanted has also produced slot machines with an addictive turn of the wheel that takes your money for the privilege. Almost all of this book will be figuratively about slot-machines-bad, rather than about slot-machines-good: because as reformers both of economic thought and of the economy we seek to change not what is right with the world, but rather what is wrong. But before we begin, we should reflect on what markets do for us. To do so, it is useful to take a long perspective and return to that era of the late nineteenth/ early twentieth century. In December 1900, in The Ladies Home Journal civil engineer John Elfreth Watkins Jr. participated in the sport of predicting what life would be like one hundred years hence. He predicted we would have “hot and cold air [coming] from spigots.” We would have fast ships that would get us “to England in two days.” “There will be airships,” mainly used by the military, but sometimes for passengers and freight. “Grand opera will be telephoned to private homes and will sound as harmonious as though enjoyed from a theatre box.” The predictions go on. Watkins described his predictions as seeming “strange, almost impossible”; but, remarkably, free markets, with their incentives to produce what people want, as long as a profit can be made, have made his predictions come true, and more. However, free markets do not just deliver this cornucopia that people want. They also create an economic equilibrium that is highly suitable for economic enterprises that manipulate or distort our judgment, using business practices that are analogous to biological cancers that make their home in the normal equilibrium of the human body. The slot machine is a blunt example. It is no coincidence that before they were regulated and outlawed slot machines were so common that they were unavoidable. Insofar as we have any weakness in knowing what we really want, and also insofar as such a weakness can be profitably generated and primed, markets will seize the opportunity to take us in on those weaknesses. They will zoom in and take advantage of us. They will phish us for phools. Information phools act on information that is intentionally crafted to mislead them. Enron stockholders are an example. The rise of Enron was based on the adoption of misleading (and then later, fraudulent) accounting. Its extraordinary profits were the result of its “mark-to-market” accounting, whereby future expected profits from an investment could be booked when the investment was made. The more usual practice is to wait until the profits are actually realized. From 1995 to 2000 Fortune named Enron the country’s Most Innovative Company. Fortune was right; its editors just failed to understand the nature of the innovations. Whether or not businessmen have good (or bad) morals is not the subject of this essay, although sometimes both of these sides will appear. Instead, we see the basic problem as pressures for less than scrupulous behavior that is incentivized in competitive markets. They are terrific at incentivizing and rewarding businessmen heroes with innovative new products for which there is real need. However, unregulated free markets rarely reward a different kind of heroism, of those who restrain themselves from taking advantage of customers’ psychological or informational weaknesses. Because of competitive pressures, managers who restrain themselves in this way tend to be replaced by others with fewer moral qualms. Civil society and social norms do place some brakes on such phishing; but in the resulting market equilibrium, if there is an opportunity to phish, even firms guided by those with real moral integrity will usually have to do so in order to compete and survive. We anticipate that our book will be unpopular (to say the least) with those who think that people all but invariably make the best decisions for themselves. Who are Bob and George, they will ask, to say that individual people are not themselves— always and invariably— the best arbiters of the decisions that affect them? Like a great deal of economics, this argument makes sense in the abstract. But when we examine this question as it describes real people making real decisions, we find that to a remarkable extent they are phished for phools: and, in consequence, they are making decisions that, applying just a bit of their own common sense, they would know are not to their benefit. We do not have to be presumptuous to see that people are making such decisions. We know because we see people making decisions that NO ONE COULD POSSIBLY WANT. Henry David Thoreau remarked that “the mass of men lead lives of quiet desperation.” Remarkably, a century and a half later, in the United States, almost the richest country the world has ever known, too many lives are still led in quiet desperation. Just think about poor Mollie in Vegas. Four broad areas indicate how widespread are the NO-ONE-COULD-POSSIBLY-WANTs, regarding personal financial security; the stability of the macroeconomy (the economy as a whole); our health; and the quality of government. In each of these four areas we shall see that phishing for phools has significant impact on our lives. Personal Financial Insecurity. A fundamental fact of economic life has never made it into the economics textbooks. Most adults, even in rich countries, go to bed at night worried about how to pay the bills. Economists think that it is easy for people to spend according to a budget. But they forget that even if we are careful 99 percent of the time, the remaining 1 percent, when we act as if “money does not matter,” can undo all that prior rectitude. And businesses are keenly aware of those 1-percent moments. They target the events in our lives when love (or other motivations) trumps our budgetary caution. For some, this is an annual Christmas potlatch. For others, it occurs at rites of passage: such as weddings (where the wedding mags assure brides that the “average wedding” costs almost one half of annual per capita GDP); funerals (where the parlor director carefully lays out the caskets to induce the choice, for example, of the Monaco “with Sea Mist polished finish, interior richly lined in 600 Aqua Supreme velvet, magnificently quilted and shirred”); or births (where Babies “R” Us will give a “personal registry advisor”). But rites of passage are not the only life punctuations where sticking to budget is presented as being mean. It is thus no coincidence that, as rich as we are in the United States, for example, relative to all previous history, most adults still go to bed worried about their bills. Producers have been just as inventive in getting us to feel we need what is produced as they have been in filling the needs that we really have. No one wants to go to bed at night worried about the bills. Yet most people do. One source of our angst about those bills comes from rip-offs: as consumers we are especially prone to pay too much when we step outside of our comfort zone to make the rare, expensive purchase. In some 30 percent of home sales to new buyers, total— buyer plus seller— transaction costs, remarkably, are more than half of the down payment that the buyer puts into the deal. Auto salesmen, as we shall see, have developed their own elaborate techniques to sell us more car than we really want; and also to get us to pay too much. Nobody wants to be ripped off. Yet we are, even in the most carefully considered purchases of our lives. Financial and Macroeconomic Instability. Phishing for phools in financial markets is the leading cause of the financial crises that lead to the deepest recessions. Regarding financial crises, the now-famous phrase “This time is different” is simultaneously both true and false. In the boom that precedes the crash, phishers convince buyers of the assets they have to sell that “this time is different.” It is, for example: Swedish matches in the 1920s (Ivar Kreuger of Kreuger and Toll); the dot-coms in the 1990s; subprime mortgages in the 2000s (Angelo Mozilo of Countrywide). Yes, every time it is different: the stories are different; the entrepreneurs are different; their offerings are different. But, also, every time it is the same. There are the phishermen; there are the phools. And when the built-up stock of undiscovered phishes (called “the bezzle” by economist John Kenneth Galbraith) gets discovered, asset prices crash. The investment managers who purchased the packages with the bad mortgages in the buildup to the 2008 crash could not possibly have wanted them. And then, painfully, when the phish was revealed, terrible side effects occurred: confidence was lost throughout the economy; stock prices halved; employed lost their jobs; and the unemployed could not find them. Long-term unemployment reached levels not seen since the Great Depression. Health. Even regarding health, which is probably the strongest need for those of us who are already well fed, well clothed, and adequately housed, the purveyors of medicines phish us for phools. Back in the 1880s, when Daniel Pinkham, off in New York, noticed that women there were greatly worried about kidney problems, he wrote home that they should be added to the list of ailments for which the family’s Pinkham Pills would be a remedy. Advice taken. Today the Pharmaceuticals can no longer just add a disease to a list. In the United States, they must run two gauntlets. They must obtain the approval of the Food and Drug Administration, which requires randomized controlled testing; they must also convince the doctors to prescribe their pills. But they also have more than a century of learning how to get past these barriers. Some drugs that successfully run both gauntlets are no more than marginally beneficial. Worse, a few are genuinely harmful, such as Vioxx (an anti-inflammatory like Aleve) and hormone replacement therapy. In its five-year career, from 1999 to 2004, Vioxx is estimated to have caused 26,000 to 56,000 cardiovascular deaths in the United States; failure to notify women of suspicions about hormone replacement therapy, by doctors and Pharma, is estimated to have caused some 94,000 cases of breast cancer. No one wants bad medicine. The effects on health go far beyond bad medicine. Consider phood and its consequences. About 69 percent of American adults are overweight; and more than half of them (36 percent of Americans) are, furthermore, obese. A cohort study of more than 120,000 gives a surprisingly precise picture. The interviewees, who were mainly registered nurses, were followed up at four-year intervals, from the late 1970s through 2006. The average four-year gain was 3.35 pounds (translating into a twenty-year gain of 16.75 pounds). Statistical analysis associates the 3.35-pound gain with 1.69 pounds for potato chips, 1.28 pounds for potatoes (mainly French fries), and 1 pound for sugar-sweetened beverages. Figuratively, those nurses could not stop noshing on their potato chips (salt and fat) and French fries (fat and salt) or slurping their colas (sugar). They made those choices voluntarily. But beyond the nurses, and more generally, we know that Big Phood commissions scientific laboratories to calculate consumers’ “bliss points” that maximize their craving for sugar, salt, and fat. Yet no one wants to be obese. Tobacco and alcohol are other health-related phishes. But there is a remarkable difference between the two. No one now thinks that it is smart to smoke. As he is writing this paragraph, George works in a large office building in Washington, HQ 1 (Headquarters 1) of the International Monetary Fund. There is a ban on smoking inside. But as he arrives in the morning, he passes a scattering of smokers outside. The smokers all pointedly avoid his gaze. Without a word spoken, they know that he is thinking that they are risking their lives: for a pleasure hardly worth it. As a result of this censure and self-censure, the fraction of smokers in the United States has fallen by more than half since the bad old days when people who should have known better were arguing that smoking really was good for your health: it helped you lose weight. There is another legal drug, besides tobacco, that is quite possibly yet more deleterious; but it provokes far less censure. David Nutt and colleagues in the United Kingdom, and Jan van Amsterdam and Willem van den Brink in the Netherlands, convoked groups of experts to evaluate the relative harms of drugs in their respective countries. Taking account of harm to others— rather than just harm to self— Nutt and his colleagues judged alcohol the worst of all; van Amsterdam and his associates viewed it as second to crack, but only by a slim margin. We shall see later (from lifelong studies) that alcohol abuse is quite possibly the single greatest downer in American lives. Yet the bars and the restaurants and the airlines and our friends at parties all push us to have a drink, and then sometimes another, and another, …. There is little consideration that having another drink is a choice that is already all too easy. No one wants to be an alcoholic. Yet rather than dissuasions, there are persuasions. Bad Government. Just as free markets work at least tolerably well under ideal conditions, so does democracy. But voters are busy with their own lives; it is thus all but impossible for them to know when a politician deviates from their true wishes regarding much legislation. And also just because we are human, we are prone to vote for the person who makes us the most comfortable. As a result, politics is vulnerable to the simplest phish, whereby politicians silently gather money from the Interests, and use that money to show that they are “just one of the folks.” Our later chapter “Phishing in Politics” will describe a 2004 election campaign of Charles Grassley of Iowa, who at the time was the chair of the Senate Finance Committee, and who had gathered a multimillion-dollar war chest and showered the state with TV ads, in which he is just “one of us,” back home, on his tractor lawnmower. There was nothing terribly unusual about the role of money in this campaign. On the contrary, we have chosen it because it is so typical. But (almost) no one wants a democracy where elections are bought in this way. Excerpted from Phishing for Phools: The Economics of Manipulation and Deception by George A. Akerlof and Robert J. Shiller. Published by Princeton University Press. Reprinted by permission. Economic Theory Is Dead. Here’s What Will Replace It. Nobel laureates George A. Akerlof and Robert Shiller are authors of Phishing for Phools: The Economics of Manipulation and Deception, from which this article is excerpted. Akerlof is Professor of Economics at University of Berkeley. 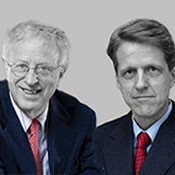 Shiller is Professor of Economics at Yale University, and the co-creator of the Case-Shiller Index of US house prices.